So, I'm a little over a week into eating vegan. In some ways it's easier than I thought it would be but there are a couple of issues. First, if you've been reading the blog for a while then you know how I feel about my coffee. I have a love affair with my coffee every morning. I get up a full hour earlier than I need too just so we can share some alone time. We snuggle in my big comfy chair. I whisper my dreams and aspirations to my coffee while it tells me in it's own quiet voice that I can make those dreams happen... you get the picture. However, our love affair has hit a rocky patch. Half & Half isn't vegan and that is a problem. I tried alternative 'creamers'. I used almond milk first and it was just barely okay in my coffee. Then I tried a coconut milk creamer by So Delicious that was better and even good. Still, it isn't Half & Half. I found myself leaving coffee in my cup. 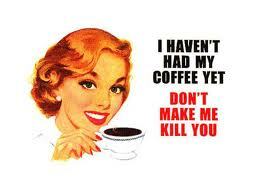 Then I found myself only drinking about half of my coffee, which is a bit of a hazard really. (If I'm expected to form coherent sentences it's really imperative that I drink all of my coffee.) Then I ran out of the So Delicious creamer but still had some Half & Half... Now my coffee is once again non-vegan. Second, there's this fantastic thing here called The Pumpkin Festival. It takes place every September with a carnival, craft show, talent shows, princess contests, a 10k race, parade, and lots of food made from pumpkins. Things you don't think of when you think pumpkin. Like chili. Not kidding. Also, there's of course pumpkin pie, cookies, fudge, baked beans, pancakes, and best of all, pumpkin ice cream. Also, not vegan. I passed on everything but the pumpkin ice cream. I kind of feel like I cheated. However, we are choosing a primarily plant-based diet for the health benefits. I don't think such a minimal amount of Half & Half and the pumpkin ice cream is going to thwart our effort entirely. Cheese has been hard just because it's so convenient. I haven't had any though. Not sure how long I can go without having pizza or my mom's vegetarian lasagna. Probably going to have to allow myself 'occasional' foods every few months. Oddly enough, the one thing I really thought I'd miss has been the easiest to give up. Greek yogurt. Oh, and I turned down birthday cake. TWICE. Overall, I'm very happy with what I'm doing. I feel fantastic and have lost a few more pounds. My big concern right now is that I'm leaving to go to the Dominican Republic next month for 8 days. Just me and my two sisters on a beach... awesomeness. I just gave up fish and seafood in the last month or so. Do I eat it while on vacation on an island in the Caribbean??? I'm struggling with this one. I have zero desire to eat any other meat. Honestly, I've not missed fish at all either. Having it readily available while on vacation may be a different story because when I think of 'beach vacation' I think umbrella drinks and delicious seafood. We'll just have to see. Fred made a fantastic vegan butternut squash soup this week. It was crazy good! I will be posting the recipe soon! What is the hardest thing you've given up in order to have a healthier lifestyle? From a life expectancy standpoint, vegans have shorter average life spans than vegetarians primarily because they lack protein in their diet. Fish and seafood is extremely healthy for you! If you are doing this for health reasons, I am here to play devil's advocate and let you know that vegetarian is actually healthier than vegan. If you are doing it for philosophical reasons, I can't argue.. and whatever you choose, is your choice and I back you 100%. I just wanted to share that factoid with you (I learned it in a graduate-level course I took: Exercise & Aging). @trikatykid, first off thank you for supporting my wife in her (mostly) vegan adventures. The myth is that us humans need lots of protein and the best/only place to get it is from meat. That's total hogwash (no meat pun intended :) We do need it, and protein needs vary from person to person, but the facts are that we humans (especially Americans) get way WAY too much protein - 2-6X what we need, and the majority of it is from animal products. Whole grains, beans, lentils, legumes, nuts and seeds, along with a huge and healthy variety of protein rich vegetables provides AMPLE protein for all of us and the quality is equal or higher than meat protein. Even professional athletes and bodybuilders can thrive on a vegan diet. Meat (even fish unfortunately) causes inflammation of our arteries, leading to atherosclerosis, leading to heart disease or stroke - the #1 and #4 causes of death in America today. A vegan diet has no cholesterol and reduces inflammation in the body. A vegan diet is proven to have exponential cancer (#2 cause of death in the US) prevention and cancer fighting abilities than either a meat eater or vegetarian even (dairy is not good for you either). A vegan diet has also been proven superior in preventing Alzheimer's (#6 on the death list), preventing/reversing diabetes (death list #7), and also buidling a stronger immune system. The stronger immune system fights influenza and pnemonia (the #8 leading causes of US death). A vegan diet is also proven effective in preventing/treating nephritis, nephrotic syndrome, and nephrosis - which is #9 on our US death list and ironically - a protein related condition, with treatments recommending a REDUCTION of protein along with cholesterol (meat!) and triglycerides in the diet! Protein deficiency is an extremely rare occurance and is almost always a genetic type condition or present when people are quite literally starving to death. Actual death by protein deficiency is even rarer. However, nearly every applicable top cause of death can be tied back to an unhealthy diet and lifestyle based on (over)consumption of meat, dairy, sugar, and processed food "stuff". I am vegan and plan on living to be 100 years old.